Breakfast is my favorite meal! I don’t always have time for it, but it is my favorite. 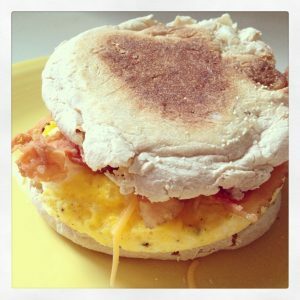 These Homemade Egg McMuffin’s are great because they are quick to make and you can add your favorite toppings. I make these at least a couple of times a month. The best part of making this sandwich is that the eggs can be cooked in the microwave. That’s right. MICROWAVE! It makes it so easy to prep this sandwich on a busy morning! Important Note: I modify my microwave to reduce the strength in order to prevent the egg from exploding in the microwave. If you don’t know how or can’t do this in your microwave, I would start at 30 seconds and add time in 10 second increments. Once you get it down and know the timing for your specific microwave, it will make it much faster in the future. If you stick a toothpick in the yoke it will not splatter in the mircowave. Thank you for pinning and for hosting such a great party week after week! This looks so good! I just wanted to let you know that I featured your wonderful project on The Inspiration Spotlight today. Have a wonderful weekend and thank you for sharing your project at homework. Thanks again for the feature, Carolyn! I regularly make egg muffins for breakfast. They are filling, healthy, and my husband loves them! Looks super good! Thank you for linking up at SHOW-licious Craft Showcase! YUMMMMMM!!! I am sorry I’ve already had breakfast today. Maybe I’ll have this for lunch!! Thanks for joining our party today at allthingswithpurpose.com!! You know we love your site!! I have definitely made these for a light lunch before! Thank you so much for your kind words. It means so much to me. You know I won’t miss your party! These are delicious! I love having them and they are so easy to make!